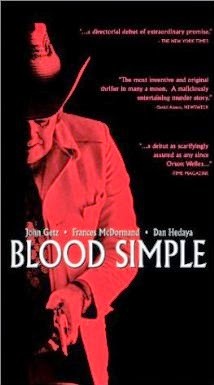 If I were 'Blood Simple', what would I have to say for myself? I think I'd say, "beginnings are always hard and most are artificial". For some films, being slow works out nicely; some things are really just worth waiting for. Luckily for 'Blood Simple', being slow actually makes the film stronger. Take out the lingering shots or the seemingly plodding pace of the characters, and 'Blood Simple' would lose its suspense and the climax would surely go unnoticed. Slow and steady makes 'Blood Simple' seem real; there are no epic car chases, no gigantic explosions, no shoot-outs, none of the standard things that make Hollywood tick. Yet somehow, thanks primarily to the Coen's now famous style, 'Blood Simple' pulls off a scarier, more engaging story than most Hollywood films could even dream of. They don't offer us much in the way of 'likable' characters. They have this way of creating people that we've all known, sometimes been, and never liked. There's always something underhanded and manipulative and scheming about all the characters; from adultery to murder, everyone is always up to something and self-serving, ulterior motives abound. 'Nice' is simply so overrated. Being not likable is actually more believable. It's not as though the characters are evil, they just aren't the kind of people we proudly admit to socializing with, or, even less likely to be admitted, the kind of people our most secret selves are. The Coens have tapped into a deep, dark, dirty well of humanity and are pumping the slimy waters into their characters; it's all tainted with realism even while each character's eccentricity seems to plummet off the deep end of possibility. The Coen brothers are definitely on to something, and it's good. Check out The Atlantic's 30 year anniversary review of Blood Simple - if you want to read more about the film. Yes, you have made me smile - I am very pleased that you do indeed recognize the value of what the Coen Brothers do and how it is quite different in style than what most directors strive for They are never looking for sensationalism, killer car chases, explosions or any other artificial device to tell the story of broken people - they really let the people just tell the story themselves. The story of people making bad decisions for the wrong reasons and then, when faced with the consequences of their decisions, just continue down the path of making even worse decisions until they have managed to either destroy themselves or the people around them. I find their stories and characters fascinating; sure I may be squirming while I am watching what will be the inevitable meltdown, but they build up to it slowly and surely until there is no alternative for these broken characters. Boxed into their own self made corners, they are doomed to suffer the backlash of their imperfect decisions. With each succeeding film, they have gotten better and better at this process, and while I know you view them as somewhat repetitive in their formula, I wait with anticipation for their next offering to see what situation and characters they are going to decimate in the next film. Thank you for this blog/comment, you have indeed made me happy this morning!